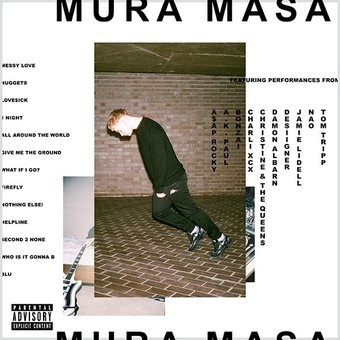 21-year old DJ, electronic music producer, songwriter and multi-instrumentalist Mura Masa has unveiled has unveiled two new songs: Blu (featuring Damon Albarn) and Second 2 None (featuring Christine & The Queens), taken from his much-anticipated, self-titled debut album. These two singles follow his Desiigner-assisted All Around The World, which came out back in May! Blu is an exquisite duet of soul and electronica while Second 2 None, twists a love of jungle and grime samples into an ethereal European torch-song. Stream them below! My favourite has to be Blu just because it's so smooth and soulful. Mura Masa’s much-anticipated, self-titled debut album, will arrive on July 14th and also includes recent single ‘1 Night’ (ft. Charli XCX). Having been nominated for his first Ivor Novello Award and added to an extensive run of summer festivals, Mura Masa’s autumn headline tour – featuring his biggest headline show to date at Brixton Academy – is on sale now. The album features an extraordinarily diverse cast-list: ranging from Damon Albarn, Christine & The Queens and Charli XCX to A$AP Rocky, Jamie Lidell, A. K. Paul, and affiliates of Alex’s own Anchor Point family (like Nao, Bonzai and Tom Tripp). In and amongst all that, musically you’re as likely to find Prince-style wired funk sitting next to trap as you are calypso-inflected house and acoustic balladry. It’s singularly Mura Masa’s vision of what pop music (and modern British culture) should look like in 2017. Even the artwork rejects the idea of running to the page, or living in a box. 04.11 - Club 2 Club, Turin.